Fath, Creekmore. 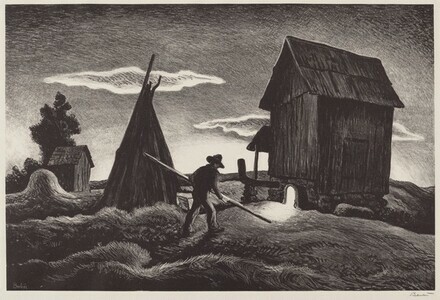 The Lithographs of Thomas Hart Benton. Austin: University of Texas Press, 1969, pp. 134-135, no. 57. Fath, Creekmore. The Lithographs of Thomas Hart Benton. Austin: University of Texas Press, 1979, pp. 134-135, no. 57. Windisch, Gail, and Sylvan Cole, Jr. Art for Every Home: An Illustrated Index of Associated American Artists Prints, Ceramics, and Textile Designs. Manhattan: Marianna Kistler Beach Museum of Art, Kansas State University, 2016, p. 66, no. 549.